The Parktown Prawn is a greatly misunderstood creature. Certainly, to most people living in Johannesburg, it's appearance is usually greeted with shrieks and arguments about whose turn it is to get rid of the Big Ugly Fucker. Legend has it that nothing can kill one of these. In fact, it's destined to share the earth with the cockroaches after a nuclear holocaust. Indeed, I have witnessed the Parktown Prawn's resilience. While gardening, Madelein happened to slice one of these bugs in half with a spade. It's front half continued to crawl around for two days after that, ending up in the lounge and exciting our already excitable dogs. 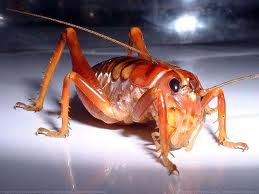 The Parktown Prawn seemed to make its appearance in Johannesburg in the 1960s. Prior to that, they were relatively unknown. Now there are several ideas as to why this may be, and you can read it all here on Wikipedia, if you are curious. I, on the other hand, have a theory of my own. You see, there is also an unprecedented amount of UFO sightings in the 1960s, the same time period the Parktown Prawn emerged. I reckon that the Parktown Prawn is an alien life form that bugged a bunch of beings on some other planet. They piled all their Parktown Prawns into a flying saucer and went whizzing through the cosmos in search of a suitable place to dump the lot. I've never heard of these prawn things! Apparently they only live in Johannesburg. I did not miss them when I lived in the UK. Oh my. How big are these things? Something like this could make me get over my fear of Stink Bugs really quick. I'm so glad I found your blogs...I'm visiting because I have your name in the Inspiration Avenue postcard swap! This is going to be fun...I can't wait to get started. The grow about five or seven centimeters. That would make it just under 4 inches. Glad you found me too! I also can't wait to get started. I will be visiting your blog soon.